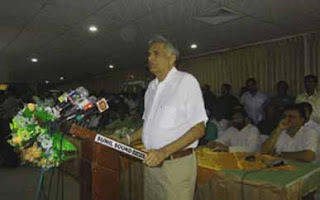 Sri Lanka main opposition, United National Party(UNP) leader Ranil Wickremesinghe challenged the government to hold a referendum if possible to obtain public views whether the Rajapaksa regime should continue.opposition leader Ranil Wickremesinghe made this observation today while addressing the maiden ceremony of the Galle District UNP propaganda members’ ceremony. The opposition leader alleged the government’s latest attempt was to hold a referendum to extend the term of the parliament. He asked the party activists to go to the villages and tell the masses to vote for the pot if they want the country and the nation to survive, or else to vote for the lamp if they wanted to see them destroyed. Meanwhile General Secretary of the UNP MP Thissa Aththanayeke noted that the party had achieved a 60% target at present with regard to the enrolment of party propaganda members.